Busy Bees was established by Miriam Tallia in 1995. Miriam has over 25 years of experience working in the childcare field. As a mother of two, Miriam knows the importance of providing a peace of mind to parents. Miriam works closely with her staff and parents to provide quality childcare to all the children enrolled at Busy Bees. Our Program is centered on the happy and healthy development of each child. Our job is to meet each child at his or her level and respond to it’s present needs. Effective methods of communication play an integral part within the child care setting. The staff at the Centre collaborate with children and their families to build strong, supportive relationships. Staff interact with children throughout their day in a warm, caring manner. Each child is valued for their individuality, and unique contribution to their classroom. Staff seize the opportunity for one- to-one interaction and respond to the physical and emotional state of each child. Teachers are role models to positive peer interaction, teaching empathy, problem solving and respect. Families are viewed as important contributors to our program, with unique knowledge, experiences and strengths. We aim to build connections between home and the centre by building trust, embracing diversity, and forming caring relationships. staff and families collaborate to support smooth transitions into the program. We encourage parents to share information about their child, state goals and participate in ongoing various forms of documentation that reveal the stages in their child’s growth and development. 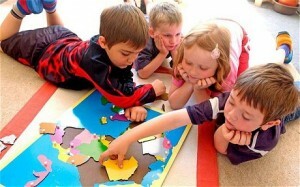 Programs are based on the interest of the child as an individual and as part of a group. a program plan might display various interests in one week. Staff plan activities to enhance and facilitate learning and exploration through play. Materials and items are added for the children to manipulate, challenging their minds to find various uses and strategies. Natural and recycled materials offer and encourage respect for the environment. Older children are able to take a more active part in the programming and collaborate with the staff to contribute ideas. Natural development skills are enhanced through play based materials as the children develop language and comprehension, fine motor, mathematics, self-help, and gross motor skills. The environment plays an integral part in a child’s development. We want to ensure that the children are safe, healthy and have balance throughout their daily schedule, indoor and outdoor. Staff utilize the opportunity to monitor and observe the various areas of interest pertaining to each child. Active play supports, exploration, competency, and reasonable risks. Children are able to test their limits and resilience to certain situations as they explore the world around them using their bodies, mind and senses. Transitions within the program are smooth, and the children take initiative practicing self-help skills.